iDeal Lift 4 Post lifts offer high-quality durability and safety. These robust units are perfect for professional automotive garages. The resilient, stable systems are designed to hold maximum loads with peak performance. 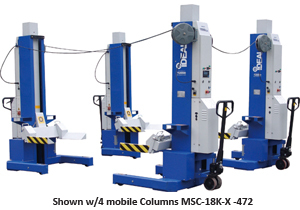 These heavy duty units offer an easy to use master controller for personal or multi-person synchronized operation. With a unique Siemens Programmable Logic Controller (PLC) and Electro-Optical encoder, each of the four columns can be operated simultaneously. The forks are easily adjustable and can accommodate a variety of wheels and vehicle sizes. The pallet jack style wheel allows for easy positioning while the heavy duty hydraulic system provides quick and efficient raising and lowering. These unique units also offer LCD screen and keyboard. This bright display clearly reveals the settings and raising height during operation. An independent locking system and emergency switch are present on each column for proven safety. The overall capacity of each column is 18,000lbs, which means the 4 column unit can hold up to 72,000lbs. A quick raising and lowering speed of 100/60 seconds allows for ultimate efficiency and performance. For professional shops, these iDeal Lift 4 Post lifts are the industry standard for heavy-duty strength and weight capacity. Each unit is built with safety in mind, and annual inspections are encouraged to guarantee long lasting security. Confirmed to hold high weight capacities, these systems are strong and dependable. Regular annual evaluations confirm safe design, construction, installation, and use of automotive raising systems. As a shop owner or technician, your safety and the safety of your staff are dependent on reliable equipment, which is why regular safety checks are encouraged. 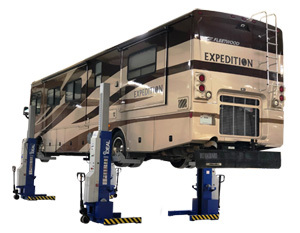 iDeal Lift 4 Post lifts can hold up to 72,000 lbs. The weight capacity and dependability of this four column unit is truly incomparable. With high-tech Siemens programmable controllers and Electro-Optical encoders, no other unit operates with such ease. Whether you’re operating the system on your own or with a partner, you can depend on all four columns to operate smoothly and efficiently.